We are pleased to announce the addition of Max & Chloe to the Webgains USA affiliate network. Max & Chloe – Your one stop shop for glam and gorgeous jewelry! Max & Chloe offers many different options such as personalized jewelry, bridal jewelry, silver, gold and pearl jewelry. You will find amazing and creative featured items on the site. Go wild with their animal kingdom pieces, be adventurous and bold with their bibs to drool over and be beautiful with their Boho look! The Max & Chloe affiliate program has constant offers running and free shipping over $150! This is a site where you will find the quality and trending jewelry that your heart desires for reasonable prices and generous giveaways! Sign up for Max & Chloe’s affiliate program and tap into the treasure today! Affiliates earn 5% commission with a 30 day cookie. Alliance(Supply).com, we made the ‘Alliance’ between (Supplies); Industrial Supplies, Janitorial Supplies & Office Supplies in one location, easy and convenient shopping. At AllianceSupply.com, we do so much more than offer supplies. We reduce cost. If you have a floor and a door, we have something that you need, whether you are a small business owner or the purchasing director of a fortune 500 company, supplies can be a significant percent of operating cost and we reduce cost. Alliance Supply is offering a 20% off Shop Vac 18 GAL. 6.5 PEAK HP WET/DRY VACUUM. Please login to your account to obtain code. If you are not joined to their program please click on this link. Please feel free to contact me if there is anything you need from us to help you drive more sales for Alliance Supply. Our last day for items to arrive by Christmas Day is December 18th for standard shipping and December 20th for express shipping. We are pleased to announce the addition of Marie Chantal to the Webgains USA network. Marie-Chantal offers the finest designer clothing for babies and children. All fabrics are sourced from the finest mills, designs are chic and comfortable and the uniqueness of the clothing set it apart from the rest. Why become an affiliate of Marie Chantal? Did you know that online children’s wear is growing at a rate faster than adult clothing? If you operate a website that attracts visitors who are researching children’s clothing why not get paid for it as well? mariechantal.com offers you the chance to earn generous commissions for sales made by visitors through your website. Becoming an mariechantal.com affiliate is FREE and EASY! All standard website tools will be provided to get you started, and you can leave the program at any time, with no obligation whatsoever. Performance based incentives available based on pre-agreed revenue targets. What are the Tools and Support you’ll receive? Omorovicza will be offering 30% off ALL COSMETICS from Friday until midnight Monday. No code is need to obtain this discount – all product prices will be reduced by 30% on page. Holiday banners have been uploaded to use for this sale event. Omorovicza Cosmetics is a premium skincare brand. Their products have won multiple awards and regularly receive rave reviews in publications like Vogue, Elle, InStyle, Stella, ES Magazine, Vanity Fair, etc. Affiliates earn 10% commission on a 90 day cookie. Start promoting today! The Webgains USA team are very fortunate to all be safe and well after Hurricane Sandy. Unfortunately, the same cannot be said for some Americans that have lost the lives and millions of others that have been displaced or lost their homes and property. All Webgains US employees still continue to help our friends and neighbors in our local neighborhoods. We see the devastation left from Hurricane Sandy in our home towns every day. So… now that we have regrouped, we can and will do more. We hope you will join us in an initiative to collect donations for the victims of Hurricane Sandy. We have partnered with Red Cross and will be donating 100% Webgains USA profits made on the 28th November to help Hurricane Sandy victims. We are inviting all our clients; affiliates, agencies and merchants to donate a percentage of their earnings made through Webgains USA on this day. All you need to do is contact us and tell us what percentage of your earnings you want us to donate on your behalf. No amount is too little. 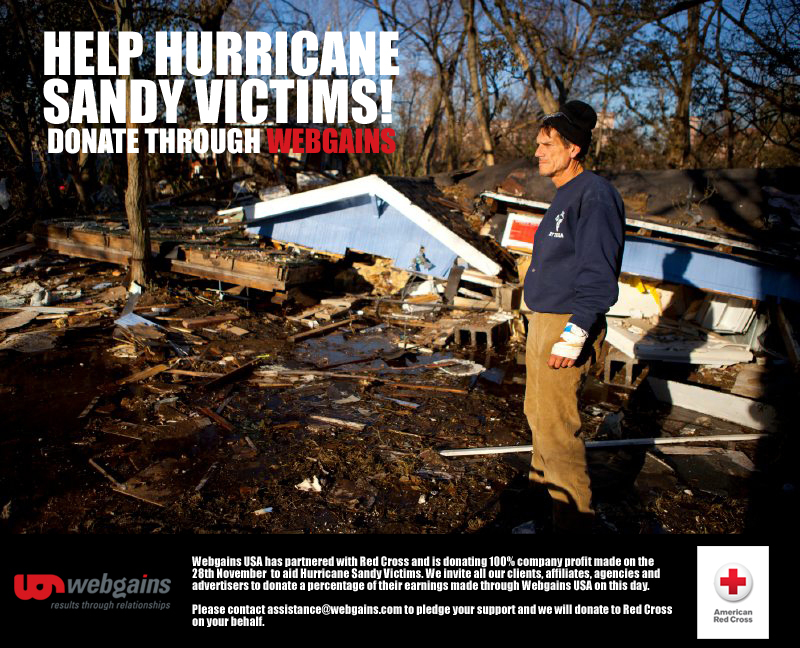 You can donate directly to Red Cross here or contact assistance@webgains.com today to pledge your support via Webgains to the victims of Hurricane Sandy. Finally, on behalf of the Webgains US team, I would like to thank all of our clients that have been kind and patient with us in the days following the storm. Here’s a list of all of the free shipping offers available from our merchants. Enjoy! Anna’s Linens – Until December 1st get 20% off window treatments with coupon code WINDOW20. Get free shipping on all orders over $100. No coupon code required. AFG Fitness – Get free shipping on all orders. No coupon code required. Astro Gaming – Get free shipping on orders over $50. No coupon code required. Bag Inc – Until January 1st get free shipping on all orders over $50 with coupon code 50$FREESHIP. Beauty Encounter – Until January 1st get free shipping on orders over $25 with coupon code BTY845. Canadian Cartel – Get free shipping on orders over $75. No coupon code required. Detroit Athletic – Get free shipping on orders over $99.99. No coupon code required. Discount Office Items – Get free shipping on orders over $75, all other orders get flat rate $5.99 shipping. No coupon code required. Electric Fireplaces Direct – Get free shipping on all orders. No coupon code required. eLUXE Canada – Get free shipping on orders over $25. No coupon code required. Event Decor Direct – Until Decmeber 31st get free shipping on orders over $500 with coupon code ZEROSHIP. iNetVideo – Until November 27th get free shipping on DVDs, Blu-Ray games, and more with coupon code FREESHIPPING. Joie – Until January 1st get free shipping sitewide with coupon code TRACTION12. Journelle – Until November 23rd get free shipping on all orders with coupon code FREESHIP. Leonisa – Until September 1st 2013 get 10% off sport bras + free shipping with coupon code SUPPORT10 or get 10% off maternity bras + free shipping with coupon code POSTPARTUM10. Lights Online – Get free shipping on orders over $49. No coupon code required. Linens-N-Things – Get everyday free shipping on all orders. No coupon code required. Little Zen Minds – Until December 31st get free shipping on all orders with coupon code SHIP2012. LIVESTRONGfitness – Lots of ellipticals, bikes, treadmills and more ship free. See LIVESTRONGfitness.com for details. No coupon code required. Lord&Taylor – Get free shipping on beauty and frangrance orders over $49 or free shipping on any order over $99. No coupon code required. Mattel – Until January 1st get free shipping + 20% off the Little Mommy item of your choice with coupon code LITTLEMOMMYDEAL. Michael Stars – Get free shipping both ways on orders over $100. No coupon code required. Milanoo – Until January 2nd get free shipping on orders over $99 with coupon code MILANOO-FS. Mizuno Golf – Until January 1st get free shipping on orders over $125 with coupon code SHIP124. Mizuno Running – Until January 1st get free shipping on orders over $75 with coupon code SHIP75. Mizuno Team Sports – Until January 1st get free shipping on orders over $100 with coupon code SHIP75. MJ Trimming – Get free shipping on orders over $75. No coupon code required. Need Supply Co. – Get free shipping on orders over $150. No coupon code required. PetSafe.net – Get free shipping on orders over $50. No coupon code required. PictureFrames.com – Until November 30th get free shipping on orders over $99 with coupon code AFREE99. Precious Moments – Until December 31st get free shipping on all orders with coupon code FREESHIP11. RedBubble – Buy 4 or more independently designed shirts or hoodies and get free shipping. No coupon code required. Sassi Designs – Until January 1st get free shipping on orders over $40 with coupon code 40SHIP. Shoebacca – Until December 22nd get 20% off all Timberland products + free shipping with coupon code TIMBERLAND. Skechers – Until November 30th get free shipping on Fall styles. No coupon code required. Skullcandy – Get free shipping on all orders. No coupon code required. Skullcandy Remix – Get free shipping on all orders. No coupon code required. Soccer.com – Until December 31st get free shipping on orders over $100 with coupon code 100KICK. Spencer’s Gifts – From November 22nd to the 25th get free shipping on orders over $35 with coupon code NOVSHIP. On Cyber Monday get free shipping on orders over $25 with coupon code SHIP25. Spirit Halloween – On Cyber Monday get free shipping on orders over $25 with coupon code SHIP1126. Stacks and Stacks – Get free shipping on over 36,000 items. Click here for more details. No coupon code required. Sun&Ski Sports – From November 22nd to the 26th, get free shipping on all orders. No coupon code required. Tactics – Get free shipping on orders over $79. No coupon code required. THMotorsports – Get free shipping on orders over $100. No coupon code required. UK Tights – Until January 1st get free shipping on all orders with coupon FREESHIP. Slimming World will be running a promotion on Cyber Monday, November 26. Your customers will be able to join Slimming World for just $11.26 for a Silver Membership, or $31.26 for a Gold Membership. At Slimming World, their vision is to make a real difference to as many people’s lives as they can and – through their groups, and online service – they do! Affiliates earn $8-$12 per membership with a 30 day cookie. Now through November 30, your customers can save 10% on their orders from 1-800-Bakery.com with coupon code THANKS10. They’ll be running a free shipping promotion on a few of their best sellers on Black Friday and Cyber Monday too. Use code FREESHIPPING. 1-800-Bakery.com is America’s neighborhood bakery on the Internet. They have a great selection of cookies, cakes, desserts, Cake Pops, Petit Fours, Sugar Free, and Gluten Free Desserts that can be delivered overnight anywhere in the USA. They can also serve your customers’ corporate needs with custom treats like Logo Cookies and Logo Cakes. Affiliates earn 8% commission on a 60 day cookie. Start promoting today! Now through December 30th your customers can save 15% on orders at Little Zen Minds with code HOLIDAY2012. Or get free shipping with code SHIP2012. Offers may not be combined. Little Zen Minds has an assortment of learning toys whose mission is for parents to encourage the love of learning in their children. They pride themselves on finding unique high quality learning toys that are engaging to children. Affiliates earn 5% commission on all sales, with a 60 day cookie and an open PPC Policy. Start promoting today!